This Web site is intended to explain and update developments on the legal suit California-based technology firm Intel Corporation brought and later dismissed against Americas News Intel Publishing LLC, a newsletter company. ANIP successfully defended itself against Intel Corporation's civil complaint in the federal courts thanks to the stellar pro bono counsel listed in the right-hand column. Ron Coleman and Colby Springer took this case on pro bono, and it was their work and dedication that formed the successful defense against Intel Corporation's lawsuit. Stepping up to defend against a challenge from a monster like Intel Corporation's legal department is not decided lightly. Many other attorneys turned me down before I met Ron and Colby. But they not only accepted this case, they did so with enthusiasm, and they showed unwavering, bedrock support throughout this ordeal. And I received without doubt the same attention and resources as any paying client would have. In fact, rather than me having to prod them to do more work, it was usually the other way around. As is often the case in life, it was not their legal counsel so much as their friendship that made the real difference. At the end of the day their optimism, humor, and intelligence kept me motivated and in good spirits throughout a long and trying process. I owe them great thanks. Ron Coleman is a commercial litigator and business attorney whose work focuses on copyright and trademark infringement claims involving the Internet--including advising clients how to avoid them. He is an expert on First Amendment and intellectual property rights, especially pertaining to the Internet. Coleman, general counsel for the Media Bloggers Association, has published numerous articles about intellectual property rights and the Internet; in fact, the first piece published on this topic by the American Bar Association Journal was written by Coleman in 1995. Colby Springer is a partner in the Intellectual Property and Litigation Practice Groups of Carr & Ferrell. Mr. Springer has experience in all fields of intellectual property law, advising clientele at every level of business development—from start ups to public companies. Mr. Springer counsels clients on acquisition and protection of intellectual property portfolios, specifically with regard to patents and copyrights. Mr. Springer has also represented a number of companies in patent, trade secret, copyright and antitrust suits. Additionally, Mr. Springer has provided counsel to various clients on interference and re-examination proceedings pending before the United States Patent Office. GRAMMATICAL B - Don't Ask, Don't Intel from Rancho Aparte on Vimeo. Just before the Thanksgiving holiday, we received notice that Intel Corporation was dropping its case against us. The reason, they said, it because we are making, "no current use [of the intel string] in commerce." They mean that Americas News Intel Publishing LLC is not currently producing the Mexico Watch Intelligence Service newsletters. But this, like so much of the disingenuous campaign they have waged against us, is patently bogus. From the beginning, and throughout our settlement talks, our written discovery, and our deposition testimony, we asserted our right to use "intel" in our name and in our domain, for commercial uses or otherwise. We reserved the right to resume its use at any point in the future for business purposes or otherwise. We specified very carefully (and the deposition record will confirm this when it is published) that we only stopped publishing our Mexico Watch Intelligence Service at our latinintel.com site because negative prevailing economic conditions dovetailed with their lawsuit, forcing us to discontinue operations. We also specified very carefully that we may elect to revive or reorganize our service in the future. This was not an operational issue. This was a LEGAL ISSUE through and through. And that was made explicit and abundantly clear throughout this entire case. Intel Corporation dismissed this case not because we had suspended publishing. They dismissed it because they knew they would lose. In coming days we will post more details, including information on refunds of the excess donations to the donors. We also will share some of the finer points of the legal process, in particular shedding some light on the brilliant roles played by our pro bono counsel. Some people aware of this case are under the impression that a monetary settlement is at stake, and that the owner of Americas News Intel Publishing LLC stands to gain a considerable sum of money in the near future. To set the record straight: The defendant is not seeking, nor is plaintiff Intel Corporation offering, a considerable sum of money. Financial settlement is not even being discussed. Ever since we received the first Cease & Desist notice from Intel Corporation back in 2007, we have been urged by people around us to (a) wrench a juicy settlement in exchange for compliance, or (b) demand a staggering price to transfer the latinintel.com domain to their company. In fact, though we had no concept that our name or domain would be coveted by Intel Corporation until the day that we read the C&D, once we appreciated the value this business asset might have to them we offered to sell it to them at a fair market value. Not for millions of dollars, as acquaintances urged, but for a reasonable and fair sum. This is no secret, we have disclosed this offer earlier in this blog, and the letter containing that offer is available for viewing at that post. As time went on we became more informed about the problem of trademark bullies in general, and Intel Corporation's nefarious history of abusing its size and position in particular. A financial solution no longer seemed appropriate or desirable. Eventually we instructed Intel Corporation to cease and desist making settlement offers, which we advised their lawyers we would not even entertain, and this, too, has been documented and publicized in earlier posts in this blog. I, Jeffrey Wright, was deposed by Intel Corporation as part of the process of the lawsuit against my company, Americas News Intel Publishing LLC. In order to attend this deposition, I had to fly to the Bay Area. (The deposition took place in Menlo Park at the spanking new offices of Carr & Ferrell, one of the firms defending us.) Intel Corporation paid for half the trip. And, since it was their deposition, for the video and the court reporter, as well as the cost of having their lawyers, both internal and external, present. Billable hours, ladies and gentlemen, billable hours. And it was remarkable in that it was hugely uneventful. At this stage in the game we fully expected an aggressive deposition, a last-ditch fishing expedition to dredge up something to support their tenuous claims, and a rhetorical blitz aimed at producing a statement from me that would, in the proper twisted context, seem to work in their favor in the litigation. The questions I was required to answer were, for the most part, very basic inquiries: Where did I go to high school? Where have I worked in the past? Or silly: Why I would purchase marketing lists rather than compiling them on my own? With what periodicity were the Monthly Reports produced? The sharpest point of the deposition came at the end, when I was asked if I "hated" Intel Corporation lawyers (see the post below) and if I considered that Intel Corporation's brand policing efforts were indeed, as I had written in a blog post at some point, based on tactics similar to those employed by the Gestapo. Lawyers tend to be a very literal bunch. As far as substantive legal queries, though, the plaintiff spent few energies. They poked around the issue of intent, i.e. did I seek to gain advantage from using the English-language string 'intel' when I formed my company and selected the name. It is so patently clear that an intelligence business might choose 'intel' in its name or domain for prima facie reasons that we did not waste much time (or, from their perspective, shareholder money) thrashing around here. They trotted out several examples of content from Mexico Watch newsletters in which Intel Corporation or chip-manufacturers or chip-manufacturing were mentioned in the content. The point being that we are competing in the same market. Recall that Intel Corporation is claiming to be in the newsletter business now, and so if we are both producing newsletters on microprocessors and semiconductor trends, then I could conceivably be held to be infringing or diluting. But obviously Intel Corporation is not a newsletter business, nor was Mexico Watch a technology information service. Technology is an important segment of the Mexican economy and the stories the lawyers cited during the deposition were simply part of the broader issue of foreign investment which we covered in our reporting. But we covered virtually every aspect of the economy at one time or another and mentioned thousands of companies, sectors, trends, and investments. So the deposition ended without much to report. We bought tickets for a cage fight and saw some light sparring instead. Why would a company who claims to be defending a $30-billion asset (the Intel brand name) from the "irreparable damage" of infringing and dilution by my company (oh, and cybersquatting) breeze casually through their single chance to directly question the company's principal? To hold me accountable? To beat a confession from me? Apparently my deposition is not relevant to their legal strategy at this point. So what could this mean? Your guesses are as good as mine. During the deposition, counsel for Intel Corporation produced a Facebook message between a personal friend and Jeffrey Wright. The attorney wanted to know, "Do you hate Intel Corporation's lawyers?" The message said as much. You might wonder why they are going through these messages in the first place. And why they brought this point up. So do we. How do Jeffrey Wright's personal sentiments bear on the legal issue in this case? We'll let you speculate for yourself, since we have no idea whatsoever. For whatever myopic reason, the company chose an English-language word as its name back in the late 1960s. Now the organization has made the collective policy decision to ignore the prior existence of the word in the public domain, and individuals in that organization are forced to act accordingly, should they wish to prosper there. So the question is not a matter of intense personal dislike. They are probably not bad folks in their private lives, and in our experience with them they are usually cordial in speech and manner, and also very sharp dressers, be assured of that. And for whatever reason, Intel Corp. lawyers needed to hear this reassurance during the deposition. Now they can read it here, as well. Nevertheless, Intel Corporation undeniably and inevitably generates and accrues animosity toward itself by choosing to use the legal system to steamroll small companies such as ours. Intel Corporation has a right to defend its trademark, as do all companies. But someone -- an individual, a person -- needs to stand up at some point and say: "This is wrong. We do not own this word in its generic sense. We know that, and we should not be leveraging the court systems in this way." Sure, a systemic reform of federal trademark rules is necessary in order to curtail the trademark bullying that has become a truly endemic problem. Still, the fact remains that some companies are exploiting and abusing the system more than others, and Intel Corporation is among the worst offenders. The individuals accepting pay in exchange for prosecuting these dark ambitions are to be pitied, not hated. We wonder, though, how they would feel if their private Facebook conversations were demanded under litigation, scrutinized by strangers, and read for the public record? Jes' sayin'. Slowly, the wicked anti-competitive abuses of the legal system by companies such as Intel Corporation are coming to light. Exposure has been slow because trademark law is esoteric and does not command the public spotlight very often. But an untold number of small businesses have suffered this bullying. Sooner or later, the aggressors will have to pay the costs of bad publicity. Authorities are beginning to sniff around in this polluted, odoriferous recess of the business environment. The U.S. Trademark Technical and Conforming Amendment Act of 2010 includes a provision that the Secretary of Commerce, in consultation with the Intellectual Property Enforcement Coordinator, shall conduct a study on “the extent to which small businesses may be harmed by litigation tactics by corporations attempting to enforce trademark rights beyond a reasonable interpretation of the scope of the rights granted to the trademark owner." 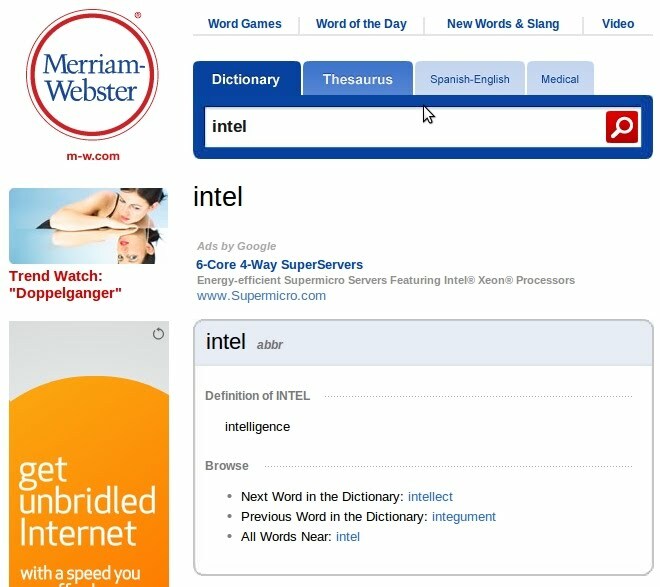 Intel Corporation is attempting to monopolize a word from the American English dictionary for its own private profit across all sectors of the economy. On July 27, 2007, Intel Corporation sent a Cease and Desist order to the small U.S. enterprise Americas News Intel Publishing LLC, a publisher of business, political, and economic intelligence on Mexico. The company charged that "because of the use of Intel's products and services across all business...the use of 'Americas New Intel Publishing' is likely to deceive and confuse consumers." Intel Corporation's charges are without merit, and unsupported by state or federal law. The word 'intel' as used in the intelligence and information services sectors may not be trademarked. The word 'intel' is an abbreviation for intelligence in the English language, and can be found in many dictionaries of record. The use of the word 'intel' as an abbreviation for intelligence is also common in public discourse, and used each and every day in the media. Intel as a shorthand term in English pre-dates "INTEL" -- which is a portmanteau for "Integrated Electronics" created in 1967, by at least 10 years. Intel Corporation coined a term identical to a pre-existing English-language word and then spent billions of dollars on its branding -- but this was at its own risk. The right to use the word 'intel' to communicate with the public is protected by the First Amendment to the U.S. Constitution. Americas News Intel Publishing has the right to use the word 'intel' to describe and sell intelligence products. 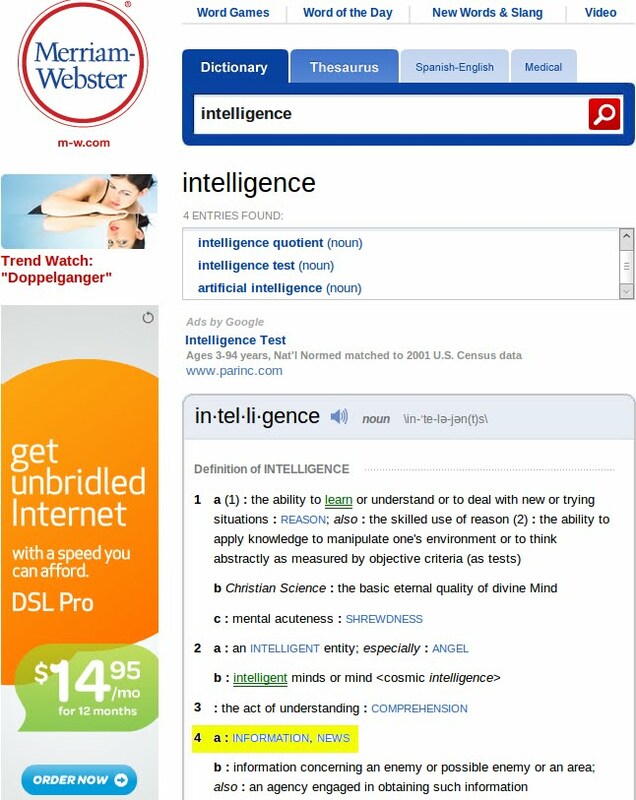 'Americas News Intel Publishing' and 'latinintel.com' both incorporate the term 'intel' in the generic sense as a descriptor for the firm's intelligence products. All of ANIP's newsletters and website information clearly defines it as "an intelligence service" on economic and political matters, completely unrelated to the manufacture of technology. 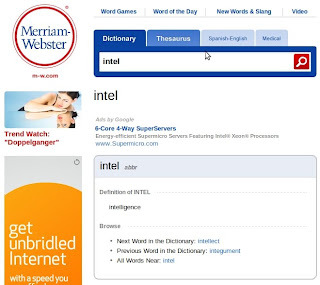 No sum of money spent to secure the public's identification of the word 'intel' with the products produced by Intel Corporation can withdraw the word, as it is used in Standard English, from the public domain. Words, as used in their literal sense, may never be trademarked. In some well-known cases, brands like 'Kleenex' or 'Thermos' become stripped of their identity, lose their value, and end up as "generic" terms. This is the converse. In this case, Intel Corporation is attempting to extract a generic word from the English language and claim it as private property under trademark laws. Intel Corporation offered ANIP thousands of dollars in "goodwill" money to assist it with the costs of abandoning the term 'intel' in its name and domain. On the other hand, if ANIP resisted the change, and was "unwilling to entertain the terms proposed," the company threatened aggressive and prohibitively expensive litigation in state and federal courts, seeking "injunctive relief, damages, and reimbursement for attorneys' fees and costs." Intel Corporation routinely issues Cease & Desist orders to small companies involved in various information and intelligence services industries that have utilized the English word intel to describe their businesses. Intel Corporation does not consider nor care whether such a description is clear, helps identify a product or services customers, or falls clearly within the domain of fair use. Its stated policy is to attack every single usage of 'intel' in a trademark, name, or domain, regardless of the fairness or legality of said usage. Most small companies cannot endure the staggering costs of fighting unfounded litigation brought by one of the largest legal forces in the world, and must accept the "goodwill" payoff. In October of 2009, Intel Corporation sued ANIP in the US District Court for the Northern District of California on eight federal, state, and common-law charges: Trademark Infringement, False Designation of Origin, Federal Trademark Dilution, Injury To Business Reputation And Dilution Under California Law, Infringement Under California Law, Common Law Passing Off And Unfair Competition, Unfair Competition, Federal Cybersquatting. Two prominent American trademark and intellectual property lawyers learned of the case, and took it on pro bono. Ron Coleman of Goetz Fitzpatrick of New York, and Colby Spring, a partner of Carr & Ferrell in Silicon Valley, are now defending ANIP against Intel Corporation and their legal representation, Harvey Siskind of San Francisco. In April of 2010, Federal Judge Charles Breyer dismissed seven of these charges, but Intel Corporation filed an amended complaint. Charles Breyer admitted this new complaint, but said: "In this case, there is some force to ANIP's assertion that it is using the term 'intel' in connection with its generic meaning...ANIP's use of the term of 'intel' appears to be consistent with the term's common meaning...defining 'intel' as 'information, news'....If ANIP's assertion is true, then Intel's dilution claim, like its infringement claim, is not cognizable." IN SHORT: If ANIP is using the term 'intel' as 'information, news' then the trademark claims against ANIP are bogus! The trial is set for May 2011. Intel Corporation has stated that it will appeal the case if and when it loses, and it has warned ANIP's owner that the case will go on for years. It has also stated that it will sue the owner separately. These threats have been made to compel ANIP to capitulate rather than fight the case in the court of law. ANIP has appealed for financial help to fight this case. All funds raised go exclusively to costs associated with the defense. None are used to pay salaries or compensation. All surplus funds will be returned to donors on a proportionate basis at the conclusion of the legal process. Donations may be made at the website http://intel4intelligence.blogspot.com/ or to the PayPal account donate@intelfortheintelligent.com. Just The Cold, Hard, Ugly Facts! FACT #1: Intel Corporation routinely issued Cease & Desist orders to small companies involved in various information and intelligence services industries that have utilized the English word intel to describe their business. FACT #2: Intel Corporation does not consider nor care whether such a description is clear, helps identify a product or services customers, or falls clearly within the domain of fair use. Its stated policy is to attack EVERY SINGLE USAGE of 'intel' in a trademark, name, or domain, regardless of the fairness or legality of said usage. FACT #3: Intel Corporation routinely offers these small companies -- using 'intel' in the generic, English-language sense of the word -- THOUSANDS OF DOLLARS in order to compel them to accept a changeover without going to court. FACT #4: Intel Corporation informs all of these same small companies that if they do not accept a "goodwill payment" and abandon any usage of 'intel' that it will mount a prohibitively expensive federal lawsuit against them, and spare no expense it its prosecution. FACT #5: Despite what the company may say, this IS NOT STANDARD intellectual property policy for those firms that have ill-advisedly chosen English-language words as their trademark. Common examples are Shell, Apple, and Vans. These companies will police and defend their trademark when it is used outside of the fair-use public domain. INTEL CORPORATION IS ONE OF THE FEW LARGE COMPANIES THAT IS SO OPENLY AND AGGRESSIVELY PURSING THIS BLATANT ABUSE OF THE LEGAL SYSTEM, USING ITS FINANCIAL MIGHT TO FORCE CAPITULATION AND BANKRUPTCIES OF SMALL COMPANIES ACROSS AMERICA AND THE WORLD!!! A few weeks ago, we received yet another communication from a company that had been sued by Intel Corporation. This company, like our own, used "intel" in its domain name. And this company, like our own, is engaged in the business of providing information and news. The owner of this small company told us that the legal costs associated with defending himself were beyond the capacity of his firm to absorb, and that he would probably be forced out of business. At best, the costs of rebranding and reworking his entire public relations network (social media website, etc.) would represent a crushing expense that the company may or may not survive. We have received contact from numerous companies, and it is clear that there are multiple examples of Intel Corporation attacking private entities using the English-language word in its public usage context. Let's set out some facts. Any amount will help. We encourage people to donate $5. We'll make you a cappuccino next time we see you. Use the link on the right-hand side of the page. A very pithy and unbiased summary of the dispute to date may be found here. HOWEVER, it is important to note that we will be moving for a summary judgment, and this is a very likely scenario. The hearing for the motion for summary judgment is not until Mar. 4. Until that time, the rest of these dates apply. This is where Intel Corporation will insist on a burdensome level of discovery and depositions, just to create a strain on our finances. But we've got enough canned food and bottled water for years, so bring it on! Friday, August 5th is the date for the Court Management Conference. We will have dates and a scenario for how this matter will proceed once we can digest the event. We are currently working with the California rap artist Grammatical B to develop a music video for the Internet that documents Intel Corporation's greed and abuse in this lawsuit. Anyone who can donate video-editing or production expertise to this cause please write to contact@intelfortheintelligent.com. The video will be broadcast far and wide, creating embarrassment for Intel Corporation but also potentially bringing fame and accolades to any of the video's creators! Intel Corporation's Complaints Not Cognizable! We have been asked by followers of this blog to give a concise update to the trial's progress. "If ANIP's assertion [that it is using the term 'intel' in its generic sense] is true, then Intel's dilution claim, like its infringement claim, is not cognizable." 2) Intel Corporation has acknowledged that the generic sense of intel is "shorthand for gathering and analyzing information." And nobody has every disputed that is exactly what the Mexico Watch Intelligence Service did, when its newsletters and briefs were in publication. Therefore, UNLESS THE JUDGE CHANGES HIS MIND, WE WILL DEFINITELY WIN THIS CASE. 3) Intel Corporation responds to this quandary by stating that it will produce a survey that proves that people think of the company brand INTEL before they think of informational intel when they hear the word. Under this standard, words like apple, converse, mango, puma, vans, and virgin would no longer belong to the public domain. Since that scenario is patently absurd, so is that standard, and we are confident that the judge in this case will agree and rule against these frivolous and abusive complaints. This blog is not about Intel Corporation's widespread and well-known abusive practices as a monopolist. That's gotten them into trouble in Korea, Japan, the European Union, the United States, and elsewhere. Plenty of bloggers are out there to document this. But we like to 'chime' in from time to time. "Bum-bum-bum-buuuum. Our coercive practices aren't like YOUR coercive practices." Many people are aware that on Wednesday, August 4, Intel Corporation "settled" the case brought against it by the Federal Trade Commission. What does a settlement mean here? It means that Intel Corporation knew it would lose, and agreed to nearly all of the FTC's terms, but can now deny breaking the law and maintain the official position that the FTC's complaints are all false. It's akin to pleading 'no contest' rather than 'guilty' in a court of law. "The agency investigated Intel's practices going back at least 10 years and found the company 'stepped well over the line.' The FTC said Intel told customers it would not sell products to them unless they agreed to stop doing business with Intel's rivals. The agency also said Intel redesigned its central processing units, or CPUs, to throw off competitors by making it harder for their chips to work with Intel's." Sadly, in technology, monopoly abuses means essential consumer products are kept much more expensive and unnecessarily so -- a fact that widens the digital divide and keeps vital tools out of reach of billions. The only winners are the shareholders of Intel Corporation, who enjoy profits artificially inflated by rents. In addition, Intel Corporation has retarded innovation through its disregard for legal market practices. We have been silent here for a while, and it is now time for an overdue update. The reason we stopped publishing the blow-by-blow is because on July 13, we had a court-ordered mediation with Intel Corporation. It is always best to approach these matters with clear eyes in good faith, and so we wanted to static as low as possible. Time to turn the volume back up. Mediation failed. We did not accept any settlement. The case will move forward now, as Judge Charles Breyer has elected to give Intel Corporation its day in court, and so many months still lie ahead. Intel Corporation has made it clear that they despise this blog. They think it improper, indecorous, outside the bounds of civilized courtroom battles. But the fact is that Intel Corporation wields disproportionate advantage on the legal terrain. Its pockets are bottomless. Its legal army is the largest and most battle-hardened on the planet, at least in the private sector. It "polices its brand" like the Gestapo policed Germany. So this blog is a vital tool in our effort to win justice for our cause and also to prevent Intel Corporation from obliterating small private individuals in its zeal to enhance its balance sheet. Sure, intellectual property protection, but the 'shoot-first-ask-questions-later' doctrine is vile and impermissible in a free and fair society. This blog not only has the mission of shedding light on the process and providing guidance for others that may be facing a legal harassment campaign by Intel Corporation or any other large entity. It also has the mission of raising money to finance the campaign. Our lawyers are representing us pro bono and it is because they believe in our cause, in our eventual triumph, and in the basic tenets of justice. Intel Corporation has told ANIP that it is "lucky" to have pro bono representation. We are lucky to have Ron Coleman and Colby Spring on our side, of that there be no doubt. They are among the top lawyers in their field in the United States. But it is not a matter of luck. It is our hard, tireless work to secure pro bono representation, to raise money to fund out-of-pocket legal expenses, and to publicize the affair via this blog that has enabled us to struggle against Goliath. If you have read this far, please consider donating to this cause. You may donate via PayPal at donate@intelfortheintelligent.com or through the link at the right. We are only using the money for necessary expenses, and much of the battle continues to be funded as much as possible by ANIP owner Jeffrey Wright, whose company was dragged under in part by Intel Corporation's legal abuses. We pledge that we will use the money fairly and prudently, and that we will return any unused funds to donors when this case concludes. So please, donate now; even an amount as small as $1 will be appreciated and wisely employed. On July 13, 2010, Jeffrey Wright, the owner of Americas News Intel Publishing LLC, traveled to San Francisco at his own expense to attend a court-ordered mediation with Intel Corporation and their lawyers. The fact of this mediation is public record, but everything about it is confidential, according to the law. 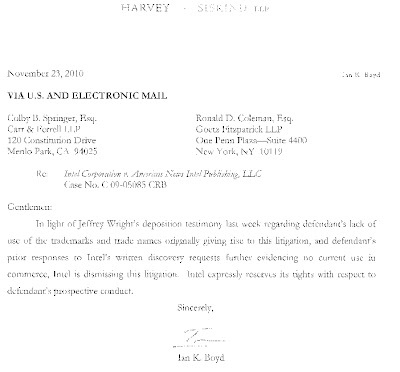 Mr. Wright cannot, therefore, discuss whether or not Intel Corporation offered him a settlement payment. And if they were to have done so, he could not reveal just how large it was. But there was no settlement agreement reached, no deal, no backing down. The matter will be decided in the courts. Intel Corporation has vowed that "there will be no shelter" for Americas News Intel Publishing LLC. 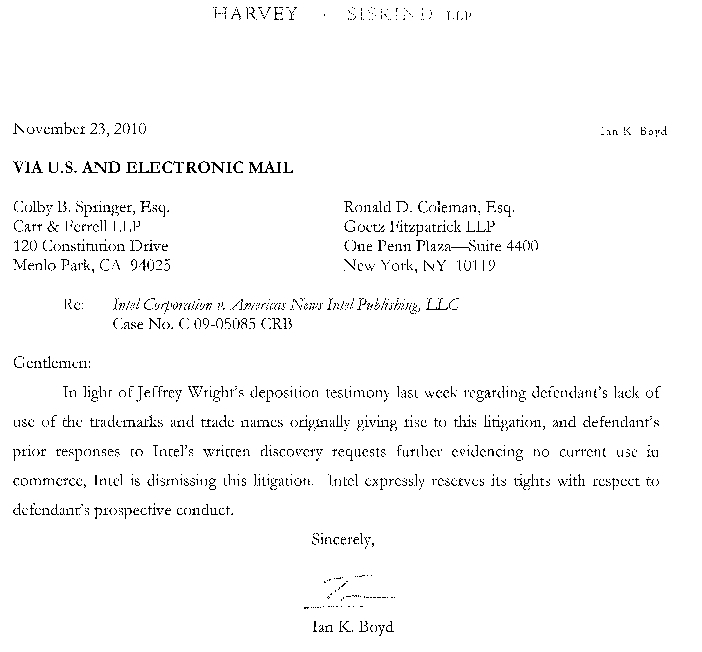 It has threatened to sue not only the company, but Mr. Wright personally, for damages, legal fees, and all the other avaricious relief it can obtain. This a risk that Mr. Wright is clearly ready to assume. We invite you to stand with us! On July 12, 2010, the Honorable US Federal Judge Charles Breyer issued an order denying our motion to dismiss the 8-count complaint that Intel Corporation has lodged against our company. This is, obviously, unfortunate news. It cannot alter the outcome and our ultimate, inescapable triumph. But it means that more time, more funds, more grating Intel verbiage, and more taxpayer resources will be spilled down the drain before it is all over. In the first hearing, readers recall, Breyer did indeed dismiss all charges except for the cybersquatting charge, which is the most disingenuous of the complaints, and which only survived because our lawyers had not specifically addressed it in our first motion to dismiss. A complete reversal now of his earlier position simply means that the trial will plod forward. But there is ample room for optimism within Breyer's order. The text of the decision essentially says: Intel Corporation, your facts are porous and nescient, but you have piled on such a mountain of them that this court find itself in the tedious position of having to give you an audience. To wit: "In this case, there is some force to ANIP's assertion that it is using the term 'itel' in connection with its generic meaning....Thus, ANIP's use of the term of 'intel' appears to be consistent with the term's common meaning...(defining 'intel' as 'information, news'). Despite the potential strength of ANIP's argument, the Court finds that dismissing Intel's Complaint on this ground would be premature." And later: "Arguing to the contrary, ANIP maintains, in a repeat of a previous argument, that Intel's dilution claim fails because ANIP is using the term 'intel' in its generic sense. If ANIP's assertion is true, then Intel's dilution claim, like its infringement claim, is not cognizable." So, Judge Breyer seems to be saying that if we can prove Americas News Intel Publishing and its latinintel.com website are in the intelligence business, offering news analysis and information, then Intel's infringement and dilution claims are patently bogus. The intelligence business is not that arcane, and it is pretty darn easy to see that ANIP and latinintel.com and Mexico Watch have been for years engaged in the very specialized but very straightforward business. This test resoundingly passes the 'moron in a hurry' test. Intel Corporation is wrong. Indeed, everyone already knows this, including Intel Corporation, but legally the common understanding of this fact has not been codified or proven, so we all most go through the motions in order to put an end to Intel Corporation's multiple frivolous campaigns in this vein. It bears consideration that dismissing a complaint is rather extraordinary. It means that the court deems the complaint to be so obviously lacking of merit, so flimsy and unfounded, that it is not even entitled to its day in court. The fact that the complaints were dismissed in the first hearing reflects just how vapid Intel Corporation's grievance is in terms of legal relevance. Granting a hearing to the Plaintiff is almost a pro forma nod toward their civic rights. Rant incoherently, and you are just another madman upon a soapbox in the plaza. Furbish your rants with expert legal counsel, and a public magistrate will be compelled to sit and endure them. To be honest, we did not see this one coming. This is low even by Intel Corporation's mediocre standards. "Defendant’s website also trumpets the fact that its counsel is representing it pro bono (while it curiously solicits donations for its lawsuit with Intel). A sensational claim by Defendant, yet one that is not only irrelevant but untrue." This is not a sensational claim. This is not an untrue claim. And there is nothing curious about raising donations for a lawsuit that has pro bono representation. Intel Corporation and its counsel knows full well that pro bono representation does not typically cover out-of-pocket expenses. 1) Our legal team is representing us 100% pro bono. 2) All monies that we raise by donations have been and will be used EXCLUSIVELY for incidental expenses incurred in the defense against the lawsuit by Intel Corporation. 3) Once we triumph, any surplus cash from donations will be returned to donors in a proportional amount. We are still running a surplus, and careful records are being kept to ensure just reimbursements. 4) Nobody in this defense is drawing upon donations for salary. Filing fees, courier services, and the like are examples of out-of-pocket incidentals being consumed. Hard costs deemed essential. Not so much as a cup of coffee has been purchased with the donation funds. 5) We have used all donations received to date with the utmost frugality. The longer this trial lasts, the more it will cost us. Intel Corporation knows this. In fact, a reasonable person could easily conclude that Intel Corporation, with its immeasurably deep pockets, is counting on our limited resources eventually accruing in its favor. What should your response to this petty, bogus, and haughty charge be? Look to your right and donate to our cause now! Intel Corporation has asked the Honorable Judge Charles Breyer to deny our motion to dismiss. The hearing on this motion is scheduled for July 2. • Such conduct is likely to cause confusion amongst Defendant’s actual and prospective customers. • Intel will make the requisite showing of the likelihood of the loss of such distinctiveness “through the submission of survey evidence,” which is the standard method to establish an actionable likelihood of dilution. Support First Amendment Rights! Donate as little as $5 now! PLEASE NOTE THAT DONATIONS ARE NO LONGER NEEDED. WE WON!!! DONORS WILL RECEIVE PROPORTIONAL REFUNDS ON REMAINING RESOURCES. THAT PROCESS IS UNDERWAY PENDING FINAL EXPENSES AND ACCOUNTING. END THE ABUSE BY INTEL CORP.! Our legal defense is being sponsored by the pro bono work of our counsel. All donations go to pay for incidental costs that pro bono agreements do not generally cover. At the conclusion of this process, surplus donations will be refunded proportionately. The Mexico Watch Intelligence Service, formed in 1994, established a loyal following with its unorthodox reporting, insightful analysis, and independent viewpoints. Unfortunately, during the 2008-2009 financial crisis, corporate subscription budgets dried up, a cash-flow shortage gripped Americas News Intelligence, and doors to credit slammed shut. In August 2009, publication of the Mexico Watch Intelligence Service was suspended. In November 2009, it was discontinued altogether. During this time period, the company had also to contend with a bruising legal battle with the massive California-based Intel Corporation. PLEASE DONATE TO SUPPORT OUR LEGAL EFFORTS!